Word choice is important. In regard to retail, a single word can make the difference between something flying off the rack or sitting on the shelf, which is why I am pretty sure retailers like to use the term "faux" as opposed to "fake". In the case of leather, faux leather makes the product sound like a stylish imitation where as fake leather just sounds like a cheap knock off. I suspect the recent label of "vegan" leather by retailers is intended for a similar purpose. Now you can not only feel like you are making a fashionable choice, but an environmental one as well. My skirt today is of the faux variety, but it fooled my husband who saw it, touched it, and then asked "how much was your leather skirt?" (With husbands, price definitely trumps any label an article of clothing could be given.) When I replied that my skirt was a mere $33 he was in a state of disbelief. (He probably just thought I was lying as I have an interesting system of rounding down when it comes to my purchases!) I then explained that the skirt was faux, as opposed to genuine leather. 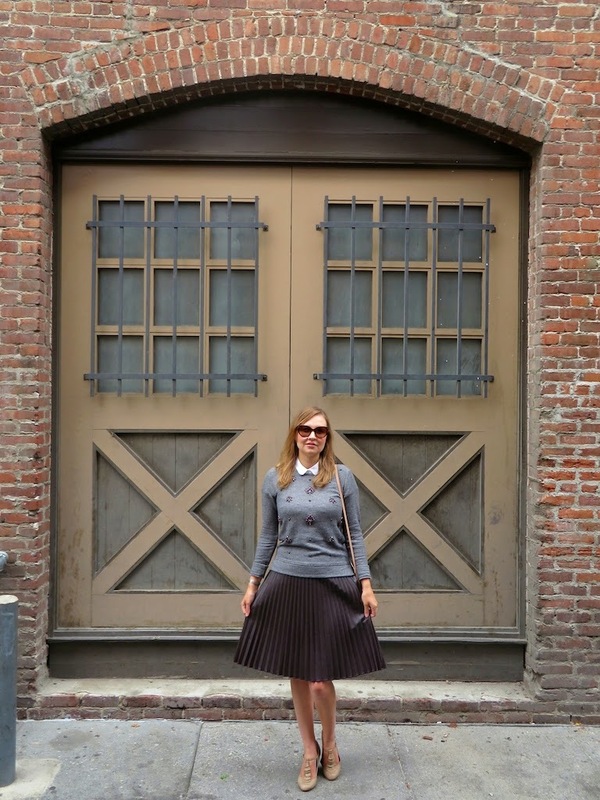 Faux or not, I still think this pleated skirt from Ann Taylor was a pretty good deal, and it certainly fools people. Oh, and the gems on my sweatshirt? Those are definitely faux as well, just in case you were wondering! Cute skirt! and love all the sweater details! Great look. so preppy and stylish outfit! love it! That sweater in particular is gorgeous. I also love the pleated skirt and retro Mary Janes. You styled this beautifully, Katie. I want an embellished sweater/sweatshirt badly. You look great. Happy Monday and Happy November! I really fell in love with the sweatshirt too, although believe it or not it's actually a sweatshirt! Happy November to you too Ada! 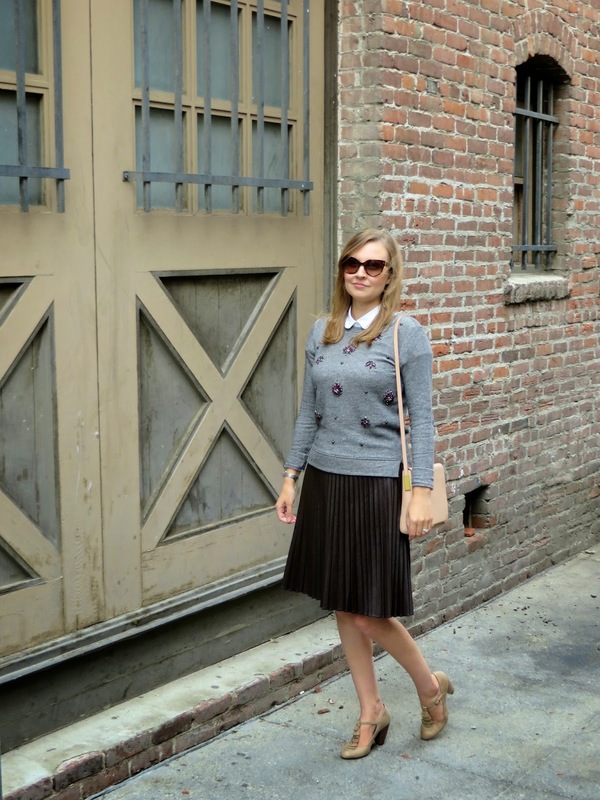 I love the jeweled sweater , I have the exact skirt too, and love it on you. I too got it at the 75% off sale. Love those adorable shoes! I got mine from the "flash" 75 percent off sale too! It certainly was a great deal! Great look! I love the pleated skirt! Very pretty! I totally hadn't thought about that with the word "faux" but it is so true! "Fake" just doesn't sound as good. Loooooove the skirt - such a great find! Thanks Ashley! Yes, it's amazing how the connotation of words can influence us in ways we never even think about! Thanks for stopping by! The pleated skirt is so pretty on you. I remember back in the day when it was called pleather and it was horrible to wear. I love faux leather - the care is so much easier. I remember "pleather" too which was sort of a derogatory term, but I agree, pleather is so easy to care for! Plus I think retailers have been able to make it look a lot more realistic. Love the skirt! The pleats and leather together are so perfect. Thank you! I've been wanting a leather, or in this case "pleather" pleated skirt for some time now!